Do you need quick and easy brain breaks for the classroom? You can download two FREE printables that are perfect for the classroom. These activities encourage self-regulation, body awareness, coordination, physical activity and balance all on one page. 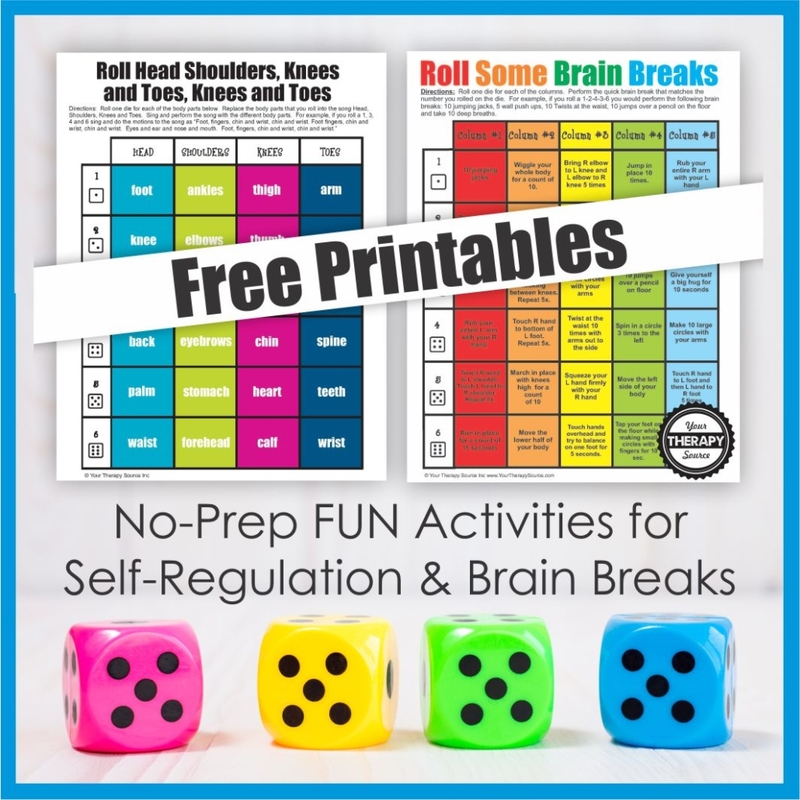 These freebies are from the complete Roll Some Fun digital download that includes 30 no-prep, boredom busting brain breaks to encourage visual motor skills, sensory motor skills, and FUN. Each game board can be done with one person or a group in a small or large space! The first free printable is one of our MOST POPULAR free downloads of all time! You can print the brain breaks for the classroom board or you can project it. You will need one die. Roll one die for each of the columns. Perform the quick brain break that matches the number you rolled on the die. For example, if you roll a 1-2-4-3-6 you would perform the following brain breaks: 10 jumping jacks, 5 wall push ups, 10 Twists at the waist, 10 jumps over a pencil on the floor and take 10 deep breaths. These brain breaks for the classroom focuses on practicing self-regulation skills. Most children are familiar with the song “Head, Shoulders, Knees, and Toes”. What happens when you mix up the body parts? Students need to stop and think before they move. 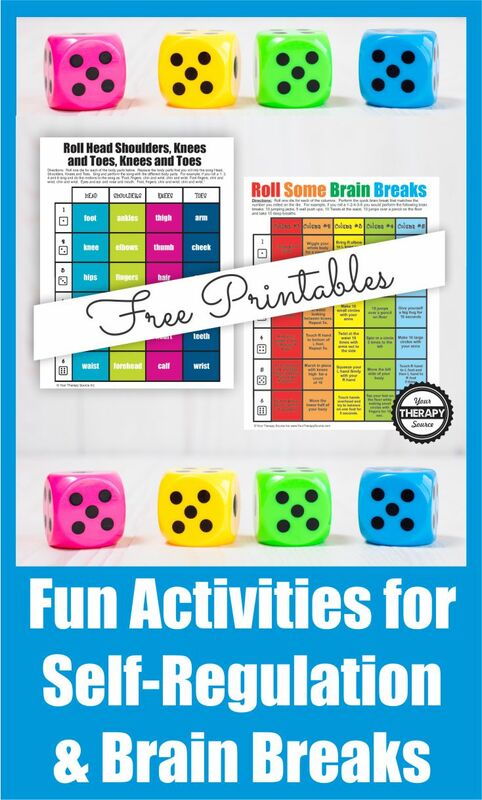 Roll one die for each of the body parts listed on the brain break board. Replace the body parts that you roll into the song Head, Shoulders, Knees and Toes. Sing and perform the song with the different body parts. For example, if you roll a 1, 3, 4 and 6 sing and do the motions to the song as “Foot, fingers, chin and wrist, chin and wrist. Foot fingers, chin, and wrist, chin and wrist. Eyes and ear and mouth and nose. Foot, fingers, chin and wrist, chin and wrist.” It is trickier than you think! Sign up to receive the weekly email newsletter and announcements from Your Therapy Source. You will be redirected to the free brain breaks for the classroom. performance. Atlanta, GA: U.S. Department of Health and Human Services; 2010.